Rx Gourmet: Heart Healthy, Diabetes Friendly — and Delicious! Afraid of cooking fish? Many people hesitate at the thought of cooking seafood, but you don’t have to be an expert to cook it. 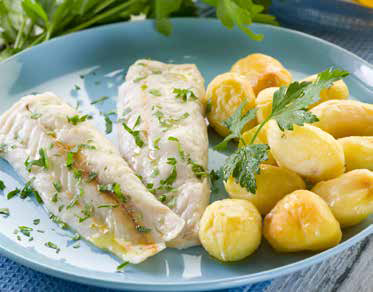 Here is a great way to cook lean white fish such as cod. (And yes, the frozen fillets turn out great this way, too!) Cod baked in foil packets with your choice of herbs is simple and anyone can do it — even novice cooks. Preheat oven to 400 degrees F. Pat cleaned fillets dry with a clean paper towel to absorb excess moisture. This is especially necessary if the cod has been frozen and defrosted. Tear off two pieces of aluminum foil about two times as long and two times as wide as each cod fillet. Lay one piece of cod diagonally on each piece of foil. Lightly spray each fillet with butter-flavored canola oil. Add salt, pepper and dried herbs. Use about 1/8 teaspoon of each herb. Fold the sides of each foil packet up around the fish until you have made an envelope that completely encloses each fish fillet tightly inside the foil packet. Place both foil packets containing the cod side by side on a metal baking sheet. (Do not stack them.) Place the baking sheet with the cod packets into the preheated oven. Bake for 20 minutes. Remove the cod packets from the oven and check each foil packet to ensure the fish has been cooked to your liking. Serve with lemon juice, tartar sauce or salsa. 145 calories; 2 g fat (11.2% calories from fat); trace saturated fat; 30 g protein; trace carbohydrate; trace dietary fiber; 73 mg cholesterol; 92 mg sodium. 0 grain (starch); 4 lean meat; 0 fat. For more free recipes and healthy-cooking tips, visit www.lowfatlifestyle.com.